1992: Andrew Morton showed a Princess in a light we had never seen before-- Diana: Her True Story became a #1 New York Times bestseller. 1999: Andrew Morton revealed the young woman behind the blue dress-- Monica's Story was a #1 New York Times bestseller. January 15, 2008: Andre... read full description below. 1992: Andrew Morton showed a Princess in a light we had never seen before-- Diana: Her True Story became a #1 New York Times bestseller. 1999: Andrew Morton revealed the young woman behind the blue dress-- Monica's Story was a #1 New York Times bestseller. 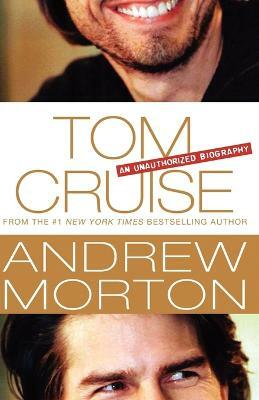 January 15, 2008: Andrew Morton uncovers the true story of the biggest celebrity of our age. Everyone knows Tom Cruise---or at least what he wants us to know. We know that he overcame a difficult childhood to star in astonishing array of blockbusters: Top Gun, Rain Man, Born on the Fourth of July, A Few Good Men, Interview with the Vampire, Jerry Maguire, three Mission: Impossible movies, War of the Worlds, and more. We know he has taken artistic chances, too, and as a result has earned three Academy Award nominations and three Golden Globes, along with the respect of acting legends like Paul Newman and Dustin Hoffman. After that, the picture becomes a little less clear. We know that Tom is a Scientologist, but not necessarily what that means in his life. We know that, despite persistent rumors about his sexuality, he has been married to Mimi Rogers, Nicole Kidman, and Katie Holmes. But it was not until the spring of 2005, when he jumped on Oprah's couch to proclaim his love for Katie and denounced Brooke Shields for turning to the Nazi science of psychiatry, that we began to realize how much we didn't know about the charming, hardworking star. For two years, award-winning biographer Andrew Morton has been tirelessly seeking out everyone from former teachers and girlfriends to Scientology insiders to friends who have watched a once-bullied, nothing special outsider transform himself into an icon Forbes has called the most powerful celebrity in the world Here, with never-seen photos and never-heard revelations, is a riveting, sometimes shocking portrait of the real Tom Cruise---his work, his love life, his marriages, his religion---from a master at uncovering the true story behind the public face of celebrity. ANDREW MORTON is one of the world's best-known biographers and a leading authority on modern celebrity. His groundbreaking 1992 biography revealed the secret world of Princess Diana, prompting Tina Brown to declare in The Diana Chronicles, The journalist Morton most reminds me of is Bob Woodward. Diana: Her True Story became a #1 New York Times bestseller, as did Monica's Story, Morton's portrait of the young woman behind the blue dress in the Clinton White House. The winner of numerous awards, including Author of the Year by the British Book Awards and Scoop of the Year by the London Press Club, he lives in London and has traveled extensively in the U.S., Canada, and Europe in his research for this biography.